To its credit, the National Archives views the 1973 fire as an “unparalleled disaster” and a “loss to the cultural heritage of our nation.” Acknowledging the tragedy, the National Archives has gone to extensive lengths to reconstruct the destroyed service files. In the years since the fire, the NPRC has collected numerous series of records (referred to as Auxiliary Records) that are used to reconstruct basic service information in lieu of an OMPF. According to the National Archives, no duplicate copies of the destroyed records were ever maintained, nor were microfilm copies produced or any indices created prior to the fire. However, the National Archives notes with some relief that millions of documents were lent to the Department of Veterans Affairs (VA) before the fire occurred, so at least those military records weren’t destroyed. 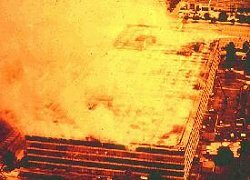 An issue that comes up – much too frequently – is VA’s claim that a Veteran’s records were destroyed in the 1973 NPRC fire. VA Regional Offices often deny benefits claims by explaining “[t]hey could not obtain the records, and they were destroyed in a Fire at the NPRC.” VA then goes on to state that now it’s your responsibility to obtain these records. Despite the fact that the National Archives has made great strides in recreating the files and maintains a Preservation Laboratory devoted to treating and making damaged files accessible, VA likes to rely on the fire in lieu of actual research. It is interesting, isn’t it, that VA had millions of documents lent to it before the fire, so these millions of files should be readily available to VA. It is also interesting that VA has a responsibility to look for Veterans records, but seemingly chooses not to do so. Case law makes clear that VA and Board of Veterans Appeals have a heightened duty to assist you and explain any decisions they make regarding your claim. Contact us. We can assist you and ensure VA knows that it’s not going to get away with bullying you out of benefits. Among other things, we can help you search public and alternate sources of data, both to assist in reconstructing your file and to establish the service-connection for your benefits claim. VA examiners know that dismissing your claim by saying “we can’t find your file” makes you think that the file itself is a requirement. It is not. What is a requirement is demonstrating that you are suffering from an illness, injury, or condition and that the illness, injury, or condition is connected to your military service. Establishing the illness and relating it to your military service is what’s required – not some file. This means VA’s refusal to consider your claim on the merits by referring to a 1973 fire is almost criminal laziness. And it’s definitely an insult to the service you have given to the United States of America. Don’t let VA get away with laziness and insulting behavior. If you – or someone you know – has ever been denied benefits by VA based on VA’s reference to the 1973 NPRC fire, contact us today. We can light a fire under VA to get your benefits review back on track. Any claim requiring VA action should be filed immediately. The good news is, by taking prompt, early action, you are in the best position to maintain or improve your benefits situation. DON’T WAIT. Contact the Law Office of Robert B. Goss, P.C. today for your FREE consultation.